The Arabic noun is derived from the word quds, which means pure. The ALL-HOLY is he who is too exalted for any needs or defects;to whom all perfection and sublimity are attributed. Allah is tooExalted for even all the perfect epithets known among human beings, andit is a miscalculation to use any epithets of mankind, whether of perfectionor defect, and attribute them to Allah, the ALL-HOLY. Allah, Praise and Glory be to Him, is too Exalted for any description perceptible by senses or imaginable by minds or foreseen by consciences. Man’s utmost effort led him to divide the attributes and the epithets into those of perfection and those of defects. 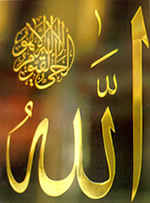 In reality, Allah is too Exalted for the most perfect attributes of man. It was said that all what is imaginable and perceptible by yourmind is totally different from the reality of Allah. Glory be toAllah, Glory be to the ALL-HOLY.